The Roaring Twenties (1939) is action director Raoul Walsh's first gangster film (and first film for Warner Bros.). [Note: Walsh replaced director Anatole Litvak at the last minute.] This newsreel-like, semi-documentary, authentic-looking film, with both hard-hitting gangster genre action and romantic sentiment, shares a lot of similarities and is reminiscent of the greatest gangster films of the 30s, including Little Caesar (1930), Scarface: The Shame of the Nation (1932), and Public Enemy (1931). All of these films portray bootlegging, numerous murders, gangster life, and the death of the hero at the conclusion. At the end of the thirties, Walsh's 'social history' film eulogizes and recreates the entire Jazz Age decade, Prohibition and its repeal (including the process of manufacturing bathtub gin), and the Depression era (through the mid 1930s) with an expansive, eulogistic perspective within an historical framework. However, the protagonist is portrayed as a reluctant victim of social and environmental conditions during the time period - as a returning WWI doughboy to a 1918 America of unemployment, he is lured to a corruptible life as a small-time hood after being denied his old job and after taking advantage of poorly-conceived government laws. Then, as a struggling taxi-cab driver after a change of fortune during the Depression, he becomes a poverty-stricken, alcoholic "forgotten man" in the 30s. It is a classic, realistic, crisp Warner Brothers melodrama with stars James Cagney and Humphrey Bogart - quintessential gangland characters, electrifying actor Cagney as the reckless leader of the gangland and Bogart as his ruthless second-fiddle lieutenant and then as his rival. This old-style film was the third and last time that the two were brought together. [They had earlier appeared in Michael Curtiz' Angels With Dirty Faces (1938) and Oklahoma Kid (1939).] This was Cagney's last gangster film until he returned to the genre ten years later in Walsh's excellent White Heat (1949). The film also features many popular songs of the era it portrays, including Melancholy Baby, I'm Wild About Harry, It Had to Be You, and In a Shanty in Old Shanty Town. The screenplay for the film, written by Jerry Wald, Richard Macaulay, and Robert Rossen, was based on an original screen story by Mark Hellinger. Hellinger's prohibition saga, originally entitled The World Moves On, was based on his experiences as a New York news-reporter during the Roaring 20s, and his familiarity with the illegal clubs of the day (i.e., the Hotsy-Totsy, Dizzy, and Blackbottom). 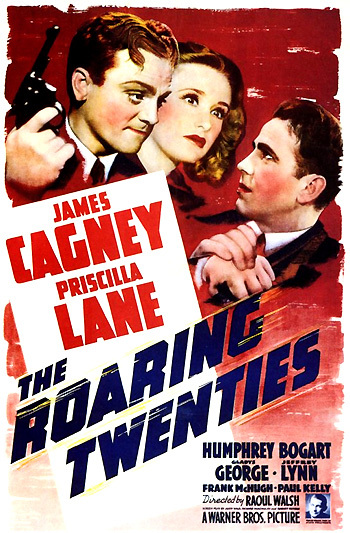 This last of the gangster films in the 30s, with James Cagney in a thinly-disguised (and humanized) lead role, was based upon the real-life rise and fall of New York mobster/racketeer Larry Fay who had a business relationship with his brassy, frowsy saloon singer-promoter and hostess Texas Guinan (Gladys George's role as Panama Smith). [Guinan was known for her famed greeting to patrons - "Hello, suckers" - that was changed to the likable "Hello, chumps" in the film)]. This superb film was not nominated for a single Academy Award. It may come to pass that, at some distant date, we will be confronted with another period similar to the one depicted in this photoplay. If that happens, I pray that the events, as dramatized here, will be remembered. In this film, the characters are composites of people I knew, and the situations are those that actually occurred. Bitter or sweet, most memories become precious as the years move on. This film is a memory - and I am grateful for it. Today, while the earth shakes beneath the heels of marching troops,  while a great portion of the world trembles before the threats of the acquisitive, power-mad men , we of America have little time to remember  an astounding era in our own recent history. An era  which will grow more and more incredible with each passing generation until someday, people will say  it never could have happened at all. April, 1918, almost a million American young men are engaged in a struggle which they have been told will make the world safe for democracy. George: Hey, do ya always come into a rathole like that? Eddie: Whaddya want me to do, knock? George: (later) There's ten thousand shellholes around here and everybody's got to come divin' into this one. During mail call, the men receive letters from back home - they have been written as part of a campaign to bolster warfront spirit: "Thousands of dames writin' us thousands of letters that are supposed to pep us up." Bartlett's letter contains a stunning photograph from his female letter-writer back in Mineola. As they are summoned back to war, Hally exchanges bitter words with their brutal Sergeant Pete Jones (Joseph Sawyer) and vows: "Someday, I'm gonna catch that ape without those stripes on and I'm gonna kick his teeth out." Back on the front on the eve of the Armistice, Hart describes his post-war law aspirations: "If I ever get back, I'm gonna have a swell law office in the Woolworth Building. I have it all picked out on the 28th floor." Upon his return, Hally will "still be in the saloon business" even though Prohibition may soon become law. He also expects to put his Army gun training to good use. And Eddie wishes to return to his pre-war job as an auto-mechanic in a garage, save his money, and one day have a shop of his own: "That's my idea of heaven, boys. A grease bucket, a wrench, and a cracked cylinder." George coldly squeezes his trigger on an advancing German enemy who "looks like a kid about 15 years old" and then casually quips: "He won't be 16." (in voice-over) 1919. The war is over and the people of New York are tiring of the constant triumphal procession of returning troops. And still, not all of them are back. There is alarming news that women's skirts are going to become shorter. Already, they are six inches above the ankle. Bobbed hair is introduced but very timidly. A young upstart named Jack Dempsey is scheduled to meet Jess Willard for the heavyweight championship of the world. People are talking about the high cost of living. Everything is going up - food, rent, clothing, taxes. The Prohibition amendment is ratified by the necessary thirty-six states and becomes the law of the land. People are dancing to the strains of Dardanella. Finally, late in the year, the last detachments of the American Expeditionary Forces come back from policing the Rhine, almost forgotten by all but their relatives and friends. (in voice-over) Back in this country, the boys who had returned from overseas begin to find out that the world has moved on during the time they spent in France...Everywhere, things have changed but particularly in New York. The old Broadway is only a memory. Gone are many of the famous landmarks, for already, America is feeling the effects of Prohibition. There is a concentrated effort at readjustment to normal peacetime activities, but unemployment coming in the wake of the wartime boom is beginning to grip the country and the soldiers find their return to face - on a different front - the same old struggle, the struggle to survive. After pounding the pavement and discouraged by his ill fortune, Eddie is desperate, grim-faced and "tired of being pushed around. Tired of having doors slammed in my face, tired of being just another guy back from France." Danny offers Eddie the use of his cab for taxi-hacking during off-hours: "Why don't you hustle it the other twelve? We'll split the gas and the oil and you got yourself a job." Oh, Mr. Bartlett, you look just like I pictured you. Brave, strong, romantic, and handsome. Eddie politely excuses himself, and promises to be in touch with her when she grows up in a few years: "Oh, in about two or three years when you get to be a great big girl." (in voice-over) 1920. For the first two weeks of the year, men can still get a drink more or less publically, because although the 18th Amendment is in effect, the law has no teeth. But on the 16th of January, the Volstead Act takes effect and traffic in liquor goes completely undercover to stay there for many long years. The word 'speakeasy' begins to appear in our language, and the forces of the underworld who best know how to operate outside the law are moving in on a new source of revenue the magnitude of which no man dare guess. Eddie: I drive this guy up in my cab and he asked me to deliver this package to a customer in here. I forget his name and I ask her if she knows who he is...I tell ya, I was deliverin' for a guy who is waitin' outside. Panama: This guy's on the up and up. He's no bootlegger. I've never seen him before. Eddie: What's your angle, sister? What bank do you want me to stick-up? Who do you want killed and what do you want done first? Panama: Well, first, let's have a drink. Panama: I think you're a pretty decent guy. I like to talk to decent guys. They're hard to find. Eddie: All right, let's talk. Panama: Things have been pretty tough, haven't they? Eddie: They could be tougher. A guy in the cell with me was talkin' about bumpin' himself off. Until I get around to that, I'm doin' all right. Panama: You've been nice to me. You took a rap that I couldn't afford to take. It would have put me out of business. And I'd hate to see someone like you banging his head against a stone wall. Now the liquor business is gonna grow big and it's gonna grow fast. So get in line, buster. Hack drivers are a dime a dozen. Eddie: But you gotta know people. Panama: Oh, I can get it - if you start small. Eddie: Tell me, what's in this for you? What's your take? Panama: Nuthin'. That story about the guy in the cell was a sad one. I'd hate to have somebody tell me that about you. Panama: I once knew a soldier like you who went to France. He never came back. I never got over it. That's why. Eddie: Is that all of it? Panama: If you don't like that story, I'll try to think of another one. Eddie: That'll do for now.